Our company has achieved laurels in providing CNG Cylinder Testing Service. Backed by our skilled professionals, we are involved in providing CNG Cyclinder Testing Service. Car's CNG Cylinder retesting with opening & fitting. The company has been authorized by m/s. Petroleum & explosives safety organisation (peso), nagpur, to do the periodical testing of cng cylinders. As per the govt of india regulation, it is mandatory to get the cng cylinders tested once in every three years. - Valve opening and Internal Inspection. - Internal cleaning of cylinders. - Cylinder Wall Thickness measurement by Ultrasonic Thickness Tester. - Water Jacket and Direct Expansion method for Hydrostatic stretch testing. 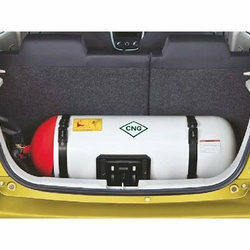 Your Vehicles CNG Cylinder should be tested every 5 years. Bring your CNG vehicles at our latest fully automatic US technology Laboratory & ensure peace of mind. We therefore truly claim we care for our customers. Service Charges: as per req. We will remove your cng cylinder from car, test tank at retesting plant and fit cylinder in the car back. Excellent service will be provided by Misra Auto Gas. A.V Automobiles Pvt. Ltd. is a trusted organization based in Delhi that is offering excellent CNG Cylinder Testing services in Delhi.NCR. We have two fully equipped testing centres where proper and hassle free testing of all the automobiles is performed. Green Tech. Cylinder Testing Co.